Rawa Islands that dreams are made of, secluded white beaches and palm fringed; images which can be found here in Malaysia, to add to the dream blazing sunlight and a cool green, clear lagoon, where fish dart and swim in never ending circles. Visitors on the beach wallowing in the sunlight. Ah! The simple pleasures of Rawa Island is 16 km off Mersing Johor, a gem of an island discovered by the lucky few. Pulau Rawa is truly a paradise island. There are many caves for exploration and offshore coral reefs rich with marine life. 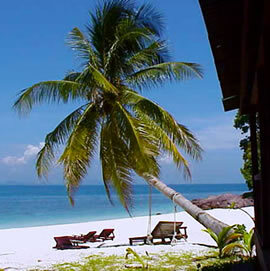 Rawa Island is an unspoilt coral island, with its white sands and swaying palm trees. The coral garden is teeming with fish and marine life, fromcoral reef fish to Pelagic fish, a surprise for many people. Giant clams abound, you may see it all but nothing is to be touched. Preservation, conservation, and a marine park to boot, not even dead shells can be taken, so beware look but don't take.
. Two way boat transfer departing from Mersing.
. Welcome drink upon arrival at our resort.
. Three meals (One breakfast, one lunch, one dinner). * Additional child (4-12 years old) in room.
. RM140.00 nett per person.
. RM70.00 nett per person.